OK so I actually had this beer in Williamsburg, but Richmond's just an hour away so I think it counts as local. Hey, it's better than having it shipped from California or Europe, right? 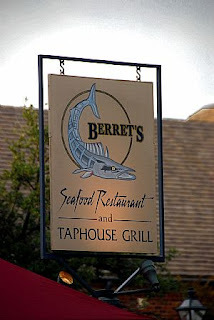 Anyways I ordered an 'imperial pint' of this stuff at a great restaurant in Colonial Williamsburg called Berret's Seafood Restaurant and Taphouse Grill. I wasn't sure how Legend's Brown Ale would do with seafood, but I knew the beer was good so I went with it. This beer had a red-brown color and a very prominent caramel aroma, which carried through on the taste as well with a sweet, but not too sweet, flavor. Not much hops taste on this one. What blew me away was how well this beer went with our seafood - and not just the Legend Brown Ale Battered Shrimp, either (which were excellent). This beer actually served pretty well as a palate cleanser as I went from pesto calamari and crab cakes to my sole and scallops baked in parchment paper with sun-dried tomato and spinach pasta. Let's just say my stomach was quite happy at the end of this meal! Next time you're in Williamsburg and want a really good meal - go to Berret's.